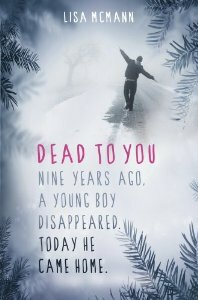 I didn't really know what to make of Dead To You by Lisa McMann. I wanted to read it after reading and loving Lisa McMann's Wake trilogy but by the time I managed to find a copy to read I had forgotten what I'd read about the book that had made me so excited. I think the main reason, and it's not a very good one, that I picked this book up over the hundreds of other books on my shelves was because it's quite a slim book to read. And a lot of times I mistake fewer pages with less depth, which is what happened with this book. Dead To You is a pretty simple story. It's the story of a boy being returned to his family after he was abducted from his front garden 9 years ago. In the past nine years both his family and Ethan have both gone through some terrible things. I can't even begin to imagine what it would feel like to have a child go missing. To not know what my child is going through, if he's suffering, if I'll ever see him again. So already my heart is being put through the wringer over this book. And things aren't improved as things go along. The family have all taken to dealing with Ethan's loss and his return in different ways and that's the real basis of the story. This major event has affected everyone's live irrevocably. There are difficult questions that aren't asked. There's hovering and panic and worry that won't go away if Ethan doesn't come home straight away. Ethan's younger brother is harbouring deep feelings of guilt but also of anger for what he's had to put up with over the past nine years. And things are tough for Ethan too. There are so many expectations - from his parents, his brother and sister, other family members, friends, neighbours - for Ethan to remember things that happened before he was taken, to answer questions or just be stared at. Reporters want to know the grisly details of his life away from his family and Ethan can't tell them much. There are things that Ethan is keeping from his family, the police, the reporters. And his memory of before is practically non-existent and his return instead of being celebratory and happy seems to further be tearing this family apart. My heart broke for the family in this book. It's a real nightmare situation to be in and I found myself sympathising with each of the characters in different ways. I understood Ethan's parents who wanted their child back so much that they stopped asking the hard questions that might push away this already fragile relationship. I thought Gracie, the 'replacement baby' was wonderful. Her easy and fun relationship with Efan provided some light-heartedness in an otherwise bleak book. The ways in which Gracie and Ethan interact with each other just shows how strained and uncertain Ethan and his other family members are together. And finally, I really got Blake's anger and resentment towards Ethan and ultimately his suspicions. As easy to understand and accept how hard it must have been for Ethan and his parents to go through what they did, it must have been equally hard to be in Blake's position. To be the one left behind to deal with the aftermath. To carry around guilt for witnessing his brother's abduction. As for Ethan, my heart broke for him the most. He wants nothing more than to remember the time before so that he can just belong and be loved.